Seoul City is expected to transform itself into a smart city with 50,000 IoT sensors operated by 2022. On April 13, Seoul Mayor Won-soon Park announced his plan to invest 1.4 trillion won (≒ 1.2 million USD) by 2022 to create a smart city. The core of smart city stressed by Mayor Park Won-soon on the same day is big data. The plan was to expand to 'smart administration' that collects urban data with 50,000 IoT sensors and establishes optimal policies for citizens' needs. In particular, the company said it will also establish a 'private, and public big data platform' by 2020 for joint use with private big data companies such as finance, distribution, portals and telecommunications. With the recent release of 5G technology and the enhancement of its related communication technologies and computing capabilities, automobiles have begun to attract attention as a new mobile platform connecting smartphones. Experts are paying particular attention to the study of connected cars and autonomous vehicles where the development of related technologies and the growth of derivative businesses are predicted. With the growth of technology and the proliferation of services related to connected cars and autonomous vehicles, automobiles can be utilized not only as a means of transportation but also as office space for meetings and as a relaxing space for leisure. 5G, which is an essential element of this connected car technology, is 5 to 20 times faster than LTE (4G) and can transmit and receive smoothly even on vehicles moving up to 310mi/h. Based on this technological growth, more than 70 organizations including automobile companies, telecom companies, IT, certification and academia are working on cross-business cooperation to develop 5G communication solutions and standards. Autonomous vehicles, the next level of connected cars, also have a significant impact on the formation of sensors and AI technology trends. Especially since the 2000s, ADAS (Advanced Driver Assistance Systems), which can enhance the safety specifications and assisting the driver, has emerged and the market for sensors and microcontrollers such as automobile cameras, ultrasonic sensors, radar has started to grow. In addition, in order to complete autonomous driving technology, not only the automobile industry but also the competition of giant IT companies have been added, which is accelerating the growth of ADAS and autonomous vehicle parts market. In particular, the market for ADAS sensors is expected to double within five years to $25.8 billion in 2022, from $12.9 billion in 2016. In this way, the research on the autonomous vehicle in the connected cars is steadily progressing. 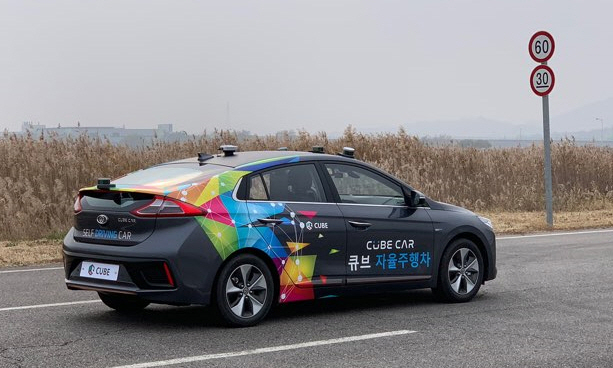 Cube's autonomous vehicle, which is being developed by Cube Intelligence, is now under trial approval from the Ministry of Land, Infrastructure, and Transport (MOLIT) for permission to temporarily operate autonomous vehicles. 'Cube AI' now has an image sensor capable of high-speed image processing with 4K UHD resolution. In the future, Cube AI plans to concentrate on developing autonomous valet parking technology among a myriad of areas. In particular, 'Cube AI' has been attracting the attention of many affiliates and related experts in the announcement that they are studying technology that allows autonomous vehicles to park unattended in underground parking lots where GPS cannot reach. Autonomous valet parking is one of the most important technologies in the autonomous car market. 'Cube AI' autonomous valet parking technology is expected to be commercialized sooner than high-speed road self-driving. 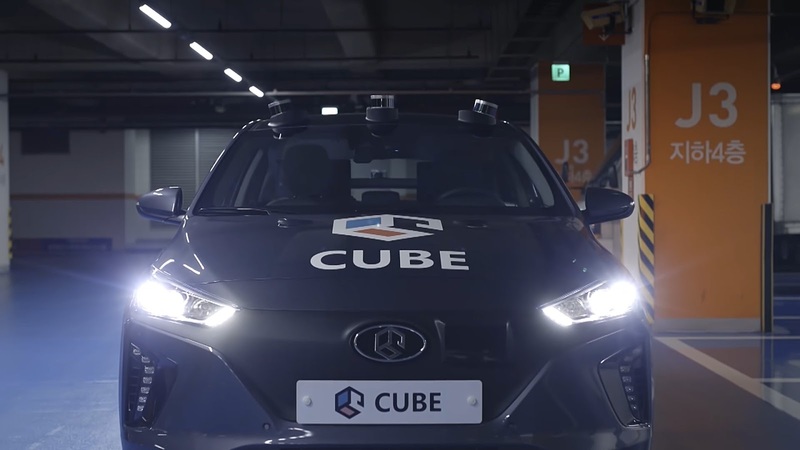 Cube’s autonomous valet parking technology is expected to come out to market first and get rid of the inconvenience of drivers like self-driving cars. 최근 5G 기술이 공개되고 관련 통신 기술과 컴퓨팅 기능이 강화되면서 자동차는 스마트폰을 잇는 새로운 모바일 플랫폼으로 주목받기 시작했습니다. 관련 기술의 발전과 파생 사업 성장이 예측되는 커넥티드카와 자율주행차 연구에 특히 주목하고 있는데요. 이렇듯 커넥티드카와 자율주행차 관련 기술 성장과 서비스 확산에 따라 자동차는 기존 이동수단 뿐만 아니라 회의가 가능한 사무공간, 여가를 보내는 휴식공간으로도 다양하게 활용할 수 있게 됐죠. 이러한 커넥티드카 기술에 필수적인 요소인 5G는 LTE(4G)보다 5~20배 빠른 속도를 자랑하며, 최대 시속 500km로 이동하는 차량에서도 자연스러운 송수신이 가능합니다. 이런 기술 성장을 바탕으로 자동차 회사와 통신사를 비롯해 IT, 인증, 학계 등 70여 개 기관이 5G 통신 솔루션 및 표준 개발을 위해 사업 분야를 초월한 협력을 진행 중이죠. 커넥티드카 다음 단계인 자율주행차 역시 센서와 AI 기술 트렌드를 형성하는데 크게 영향을 주고 있는데요. 특히 2000년대 이후 안전사양을 높이며 운전자를 보조할 수 있는 첨단 보조 주행장치(ADAS)가 등장해 차량용 카메라, 초음파 센서, 레이다, 라이다, 나이트 비전 등의 센서와 마이크로 컨트롤러 시장이 본격적으로 성장하기 시작했습니다. 덧붙여 자율주행기술 완성을 위해 자동차 업계뿐만 아니라 거대 IT기업의 경쟁까지 더해져 ADAS와 자율주행차용 부품시장 성장에 가속도가 붙고 있는 상황입니다. 특히 ADAS용 센서시장은 2016년 129억 달러(약 14조 6천억 원)에서 2022년 258억 달러(약 29조 2천억 원)로 5년 새 두 배 가까이 성장할 전망입니다. 이렇게 커넥티드카에서 자율주행차를 향한 연구로 기술의 성장은 꾸준히 진행되고 있는데요. 큐브 인텔리전스에서 자체 개발 중인 ‘큐브 AI’의 자율주행차는 현재 국토교통부로부터 ‘자율주행자동차 임시운행허가’ 승인을 받아 시험 주행을 진행 중인데요. ‘큐브AI’는 현재 4K UHD 해상도로 초고속 이미지 프로세싱이 가능한 이미지 센서를 확보한 상태입니다. 또한 앞으로 큐브 AI는 무수한 영역 중에서도 자율주행 발렛파킹 기술개발에 주력할 계획인데요. 특히 ‘큐브 AI’는 GPS가 도달하지 못하는 지하주차장에서도 자율주행자동차가 무인으로 주차할 수 있는 기술을 연구 중이라는 발표에 많은 관계사와 관련 전문가들의 주목을 받고 있습니다. 자율주행 발렛파킹은 자율주행자동차 시장에서 가장 중요한 기술 중 하나로 알려져 있는데요. ‘큐브 AI’의 자율주행 발렛파킹 기술은 고속의 도로주행보다 더 빠른 시일 내에 상용화가 가능할 것으로 예상되며 재의 ADAS기술처럼 완성형의 자율주행자동차가 나오기 전에 먼저 시장에 나와 운전자들의 불편함을 해소해 줄 것으로 기대되고 있습니다.